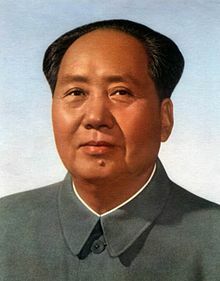 Mao Zedong (1893-1976) was the leader of the Chinese Revolution and communist China between 1949 and 1976. He was a significant influence on the conflict in Vietnam, both through his example as a communist revolutionary and as the leader of Asia’s first communist superpower. 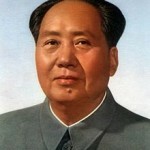 Mao Zedong was born in Hunan province, the son of an affluent peasant. He began his life as a librarian and teacher while studying both left-wing Western political texts and the writings of ancient Chinese scholars. In 1921 Mao became a founding member of the Chinese Communist Party (CCP), attending the first meeting of the party in Shanghai. In 1927 Mao led the Autumn Harvest Uprising, an unsuccessful peasant rebellion against government forces and landlords in Hunan. In 1929 Mao and his supporters formed a ‘peasant soviet’ – a self-sustaining community organised on socialist principles – in the southern province of Jiangxi. In 1934 Mao and the CCP were forced to abandon Jiangxi and relocate by foot to northern China. Their Long March, as it became known, heralded Mao’s rise to prominence as both a communist thinker and a military commander. Between 1936 and 1949 Mao Zedong and the CCP were headquartered in Yan’an. During this period Mao reorganised the party and its military arm, the Red Army, expanding his personal control over both. He also formulated his own political philosophy, adapting Marxist theory to the situation in China and rejecting advice and direction from Moscow. Instead, Mao worked to forge a revolution driven by Chinese peasantry. Using socialist principles among their own people and guerrilla warfare against their enemies, Mao’s communist movement made significant advances during the 1940s. His Red Army made rapid progress, winning support from the local population and forcing the nationalist armies of Chiang Kai-shek to scatter and flee. In October 1949 Mao addressed a rally in Tiananmen Square, Beijing, and proclaimed the formation of the People’s Republic of China, Asia’s first communist state. The victory of communism in China shifted the focus of the Cold War to Asia and drew the United States into events there. American presidents from Truman to Nixon accepted the Domino Theory, believing Chinese communism, if not checked, would spread throughout south-east Asia. The Chinese Revolution also provided ideas and inspiration for Ho Chi Minh and the Viet Minh, who studied Mao’s writings on revolution, political philosophy and guerrilla warfare. Once in power, Mao also provided significant amounts of materiel support to the Viet Minh and, later, the North Vietnamese government. After the Geneva Accords (1954) Mao pledged more than $US100 million in aid to North Vietnam. When the US began bombing North Vietnam in the mid-1960s his government sent thousands of Chinese personnel there. Many were engineers, tasks with rebuilding damaged infrastructure, such as roads, railways, bridges, dams and power stations. Chinese soldiers also targeted American planes with anti-aircraft guns, also supplied by Beijing. An estimated 320,000 Chinese soldiers served in North Vietnam during the course of the Vietnam War. Mao’s support for North Vietnam gave Hanoi a “secure rear and supply depot”, as historian Jung Chang put it. Mao himself spoke openly against American intervention in Vietnam, describing the US as the “most ferocious enemy of the people of the world”. In early 1972 Mao, aware that the Americans wanted out of Vietnam, shifted his position and met with US president Richard Nixon. This rapprochement with China was a contributing factor to the peace agreement formulated in 1972 and signed in January the following year. Mao Zedong lived long enough to see the fall of Saigon and the reunification of Vietnam. He died in September 1976, a few weeks after the formation of the Socialist Republic of Vietnam. J. Llewellyn & S. Thompson, “Mao Zedong”, Alpha History, accessed [today’s date], https://alphahistory.com/vietnamwar/mao-zedong/.